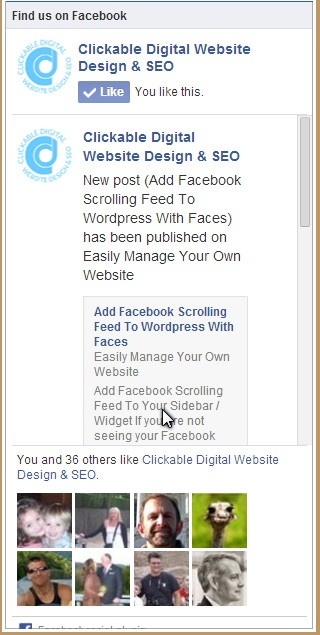 If you are not seeing your Facebook Scrolling Feed or other FB plugins in Chrome, go to your settings in Chrome. Look to the left and click on “Extensions”. Disable all extensions, then re-enable each one, one at a time and check to see which extension is the problem. I don’t know why Facebook makes it so hard to find the code for this, but they do. Some day people will understand what “user friendly” means! Log In to your WordPress Site and go to your Dashboard. Click on “Appearance” or click the arrow next to “Appearance” to see the hidden menu. Once the “Text” widget is in place, the widget will resize to allow for inputting text. There is no need to give it a title! Copy this code into the body of the box (second window for text). Now you have to change the code!!!! If you have a personal page as well as a business page, Look under to the upper right and find a drop=down arrow and select “Use Facebook as Page”. 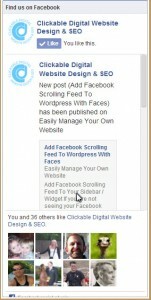 Now Copy Your URL – look for the text “http://www.facebook.com/pages/……….” Click in the url window to highlight all words. On your keyboard, hold down “Ctrl” and “C” keys to copy. BE CAREFUL TO KEEP THE QUOTATION MARKS AROUND YOUR URL WITHIN THE CODE!!!!!!!!! !